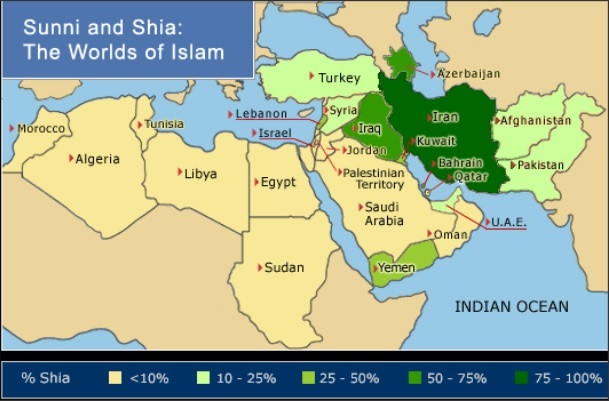 Islam: Background on Shi'ite vs. Sunni Islam and its relevance for the Middle East. Syria: the US intervention in the Syrian Civil War. Iran: The U.S. and U.N. finalized a "nuclear deal" with Iran in 2015. Al Qaeda: The origins of our enemy in the War on Terror. Defense: Defense spending, weapons planning, and other military issues. In Iraq, Saddam Hussein was a Sunni, but Iraq is majority Shi'ite. Hence Saddam's government, which was almost all Sunni, was seen by his Shi'ite population as a ruling elite. When you read in the news about "Saddam loyalists fighting the government," it usually means "Sunnis who were once in power under Saddam, fighting against Shias now in power." Iran has a strong Shi'ite majority, and its rulers (the Ayatollahs) are also Shi'ite; hence Iran is not likely to suffer from internal revolution. However, Iraq and Iran share a long border, and fought a long war in the 1980s: the Shias of Iran supported the Shias of Iraq against the ruling Sunnis of Iraq (Saddam). Now, post-Saddam, the Iranians are not opposed to the Shia Iraqi government. ISIS: ISIS is an anti-Shia group (i.e. Sunnis who oppose Shi'ite rule). The United States left post-war Iraq with a Shia Prime Minister, Nouri al-Maliki. But Iraq has a large Sunni minority, who feel disempowered (since Saddam was Sunni). ISIS ("Islamic State in Iraq and Syria") began taking territory from al-Maliki government control in early 2014. The United States sent 300 "advisers" to help the Iraqi army fight ISIS, in June 2014, after ISIS had captured substantial territory. ISIS is more accurately known as ISIL, "Islamic State in Iraq and the Levant"; the Levant is the Eastern Mediterranean area that includes Syria, Lebanon, Israel, and Palestine. ISIL had been fighting in Syria (against Assad's Shi'ite army) alongside Al-Qaeda, but broke ties with Al-Qaeda in Iraq. ISIL's goal is to establish a "Caliphate," an Islamic State (hence their name), to replace the current governments. ISIL's view of Islam often focuses on the Apocalypse (which is the same as in the Christian Bible): only when the Caliphate includes Jerusalem will the end times come. Kurdistan: The Kurds are an ethnic group in the Mideast, with an army known as the Peshmerga. In the 2016 U.S. elections, an important issue is whether to increase support of the Kurds and/or the Peshmerga. Western countries support the Peshmerga because of joint interest in defeating ISIS and Al Qaeda; but most western countries do not support an independent Kurdistan. When politicians talk about supporting local groups without committing U.S. ground troops, they generally mean "give the Kurds money, arms, and U.S. air support." For comparison. ISIS currently holds substantial territory in both Syria and Iraq, with a goal of establishing a religious Caliphate in their territory. The Kurds, majority Sunni but a Shia minority, also hold substantial territory in both Syria and Iraq, and also look towards establishing a country, which they call Kurdistan. Al Qaeda: Al Qaeda is a Sunni group which is fighting against the Shi'ite governments in Syria, Iraq, and elsewhere. In Syria, al Qaeda (and ISIS) oppose President Assad, whom the U.S. considers a terrorist dictator; i.e. they are on "our" side in Syria. In Iraq, al Qaeda (and ISIS) oppose the Iraqi government, which the U.S. set up after Saddam; i.e., they are against "our" side in Iraq. Al Qaeda is currently financed by Saudi Arabia, the country where Osama bin Laden came from. But their original funding came from the United States because we supported al Qaeda's fight against the Soviet Union in Afghanistan in the 1980s. Al Qaeda's goal is to remove all Western (non-Muslim) powers from the Muslim Holy Lands, which means Mecca and Medina in Saudi Arabia, plus Jerusalem in Israel. Syria has a Shi'ite minority (in other words, a Sunni majority) but is ruled by the Assad family, who are Shi'ite. (The Assads call themselves "Alawite"; that is a Shi'ite sect). The groups fighting in the Syrian civil war can be entirely divided along Shia-Sunni lines: Assad is supported by Iran (a Shi'ite country), and by Hezbollah (a Shi'ite terrorist group); the Syrian rebels are supported by the Saudi Arabia and the Emirates (Sunni countries), and by Al-Qaeda, a Sunni terrorist group. Red Line: President Obama declared in August 2012 that Syria�s use of chemical weapons would cross �a red line for us,� necessitating U.S. military intervention. Chemical weapon use was well established by August 2012. That list of groups above is confusing, and President Obama had trouble figuring out in August 2012 which groups to help and which to attack. Or more specifically, how to explain to Americans that we should help some groups and attack others. Obama did try to enforce the �red line,� by planning aid to some groups and attacks on others, but the American public soundly rejected any support for Obama�s policy, and the policy was abandoned. Lebanon, until the 1980s, had a power-sharing arrangement among its different religious groups. Then Syria intervened, because Assad (Shi'ite) wanted to "help" the large Shi'ite group in Lebanon. Hezbollah, the Shi'ite terrorist group, has (in effect) ruled Lebanon, with Iran's and Syria's assistance, since that time. Yemen is split about 50-50, but with Sunnis in control of the government. The "Shia insurgency" is what they call their civil war, which has been brewing on-and-off since 2004, including the period of Arab Spring in 2011. Hezbollah (Shi'ite) and Iran (Shi'ite) assist the insurgent Houthis (Shi'ite) against the Sunni government. Al Qaeda has used the chaos in Yemen to establish bases there; hence the United States often targets al Qaeda operatives (by drone strike) in Yemen. In January 2015, the Sunni president of Yemen resigned, under pressure from the Houthi Shi'ite rebel group which was supported by Shi'ite Iran. Bahrain has a Shia majority and Sunni rulers. The Arab Spring revolt in Bahrain in 2011 was put down by Saudi (Sunni) rulers. Afghanistan is 15-20% Shia; the Taliban rulers are Sunni. The long ongoing trouble in Afghanistan does not fit the Shia-Sunni paradigm; this is an ethnic conflict, not a religious conflict. Pakistan might someday have Sunni-Shia trouble, but their primary enemy is India, their Hindu neighbor. India and Pakistan were one country until the 1940s, when they split into two countries along religious lines, one Muslim country and one Hindu country. They have had several wars since then, focusing mostly on the Kashmir region, which both countries claim because it has a mixed religious history (Kashmir's ruler was Hindu but its majority was Muslim at the time the two countries split). Same story, different labels. Nigeria, like most countries in Western Africa, is Muslim in the north (near the Sahara) and Christian in the south (near the Atlantic Ocean). Boko Haram is the Islamic terrorist group fighting against Western influence ("Boko Haram" means "Westernization is sacrilege"). Boko Haram is Sunni, and was affiliated with al Qaeda until they pledged allegiance to ISIS in March 2015. The group is most infamous for the April 2014 kidnapping of 276 schoolgirls. While the group is Muslim, and are commited to creating a Caliphate, they focus on the Muslim-Christian split in sub-Saharan Africa rather than the Sunni-Shia split in the Mideast. Readers should not think that these sorts of religion-based wars are unique to the Islamic world. In the Christian world, we have the same sort of split between Protestants and Catholics: For example, when Northern Ireland (majority Catholic) was ruled by Great Britain (majority Protestant) a war ensued for decades. And even in America, when John F. Kennedy (the first Catholic president) was elected in 1960, anti-Catholic sentiments resounded among the Protestant American majority. Religious sectarianism among Christians doesn't justify religious sectarianism among Muslims -- but it does make it easier to understand! 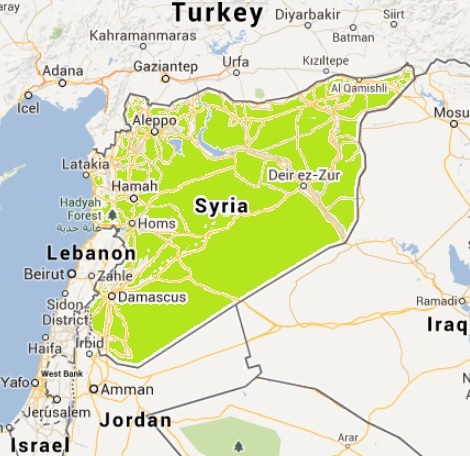 The civil war in Syria has been raging since March 2011, and has killed many tens of thousands of people (approximately 93,000 as of June 2013). It is the latest result of the Arab Spring. In 2011, the Arab Spring was running strong in several countries but has mostly played out now -- except in Syria. At issue is whether President Assad (a dictator, not an elected president) should stay in power. Two years ago, at issue was whether Assad would implement reforms, but he declined, so the rebels demanded his ouster instead. The rebels were making progress until Hezbollah joined in, early in 2013 (Hezbollah is the terrorist group that rules Lebanon with Assad's help) -- that turned the tide in favor of Assad. President Obama had previously established a "red line" that if Assad used chemical weapons, the U.S. would join the fight. Obama declared that the "red line" had been crossed in June 2013. The US, British and French had been aiding the rebels already, but only been sending "humanitarian aid" (food and medicine); as of June 2013 the US is sending "military aid" (small weapons). The Russians back Assad (who has plenty of Russian weapons already, including jets and tanks). So in effect, the U.S. is now fighting a "proxy war" against Russia and Hezbollah in Syria. Some proponents suggest that the US, UK, and France impose a "no-fly zone" in Syria -- using allied Air Forces to enforce agaisnt the Syrian Air Force. That was done in Libya successfully -- the rebels won with allied air support. Some opponents point out that the rebels' loose coalition -- called the Free Syrian Army -- has some groups which are affiliated with Al Qaeda. U.S. aid has always "vetted" each group receiving aid, with the purpose of avoiding giving anything to Al Qaeda. But of course materiel gets shared and some U.S. arms may end up in Al Qaeda hands. The primary suspect was Osama bin Laden, an exiled Saudi millionaire based in Afghanistan. Bin Laden turned against the US when troops were stationed in Saudi Arabia during the Gulf War in 1990. He issued a fatwa, or religious edict, calling for the removal of US troops from the Holy Lands of Mecca and Medina (details below under Al Qaeda). The Taliban was the Muslim fundamentalist political party which rules most of Afghanistan. They were the largest army of the mujaheddin, and were also funded by the CIA in the 1980s. Their leader was Mullah Mohammad Omar. The Taliban ruled under Shari'ah, or Islamic law as described in the Koran, which implies strict interpretation of moral codes and numerous personal restrictions. A portion of Afghanistan was ruled by the Northern Alliance, another mujaheddin group. Their leader was assassinated in the week preceding the World Trade Center attack; it is unknown whether there was a connection. The exiled king of Afghanistan, Muhammad Zahir Shah, agreed to participate in a coalition government if the Taliban is overthrown. King Zahir is 86 years old, and has resided in Rome since 1973. The document which Al Qaeda provides for its fighters is entitled "Declaration of Holy War Against the Country's Tyrants." It states in the introduction that Al Qaeda exists to end the occupation of the Muslim lands by "colonialists" and "infidels," which began on March 3, 1924. That date is when the Ottoman Empire (modern-day Turkey, who lost WWI alongside Germany) was divided up by England and France (the "colonialists" who occupied the Middle East until after WWII, which by extension includes Israel). The "infidels" refers to the modern Arab rulers of the region, whom Al Qaeda curses as its enemies, specifically calling for attacks on the rulers of Egypt, Syria, Yemen, and Saudi Arabia. Al Qaeda believes that the modern rulers of Muslim countries ("the apostate rulers") have turned away from Islam, and instead "aimed at producing a wasted generation that pursued everything that is western." The solution, Al Qaeda claims, is that "young men return to Allah" and "realize that Islam is not just performing rituals but a complete system: religion and government, worship and Jihad, ethics and... the Koran and the sword." In summary, Al Qaeda believes in ousting the rulers of Muslim countries whom they consider insufficiently Muslim. That especially includes Israel and the United States, who (in Al Qaeda's view) occupy the Muslim holy lands of Jerusalem (the capital of Israel), and Mecca and Medina (in Saudi Arabia, where the U.S. has military bases). But Al Qaeda's goal is to overthrow all leaders of the region, including Muslim leaders, in order to re-establish what they consider proper Islamic countries. While Al Qaeda's manual does criticize western values, its purpose is to advocate for Islamic rulers. Nowhere does the Al Qaeda manual discuss "hating what America stands for," nor does it even mention the United States -- Al Qaeda's purpose is to expel all non-Islamic rulers from Muslim lands. In November 2011, the International Atomic Energy Agency (IAEA) Board of Governors criticized Iran after an IAEA report concluded that before 2003 Iran likely had undertaken research and experiments geared to developing a nuclear weapons capability. A number of Western nuclear experts have stated there was very little new in the report, that it primarily concerned Iranian activities prior to 2003. Iran rejected the details of the report and accused the IAEA of pro-Western bias. The IAEA Board of Governors has found Iran in non-compliance with its Nuclear Non-Proliferation Treaty safeguards agreement. Iran says its nuclear program is peaceful. Iran also claims that it was forced to resort to secrecy after US pressure caused several of its nuclear contracts with foreign governments to fall through. The UN, US, and EU will remove economic sanctions against Iran. In April 2015, the US and Iran, alongside the rest of the U.N. Security Council, agreed on a "nuclear treaty": limiting Iran's nuclear enrichment; monitoring by the IAEA; and ending sanctions against Iran. Addressing the U.S. Congress in March 2015, the Israeli Prime Minister opposed the plan, saying that the deal is insufficiently restrictive. Most of President Obama's opponents, and many Republicans, concur with the hard-line Israeli stance that any deal with Iran is insufficient unless Iran recognizes Israel's right to exist. 1982: Israel invaded Lebanon in response to terrorist attackes by the Palestinian Liberation Organization (PLO). Israel surrounded the Lebanese capital, Beirut, forcing the PLO and its chairman, Yasir Arafat, to withdraw. Israel began its withdrawl from Lebanon in 1985; Syria still occupies parts of the country. Israel also began establishing settlements on the West Bank in the late 1970s, which are a major point of contention in today's peace negotiations. Israel made peace with Egypt in 1979, and that peace treaty survived the Arab Spring uprising in Egypt in 2011. Israel signed a peace treaty with Jordan in 1994, and now has normalized relations with that neighbor. Israel made peace with the PLO in 1993, and granted autonomy to the Palestinian Authority. That entity split in 2007 into Fatah governing the West Bank (at peace with Israel) and Hamas governing the Gaza Strip (with regular rocket fire into Israel through 2014). AIPAC is the American Israel Public Affairs Committee, founded in 1951. The pro-Israel group, with 100,000 grassroots members nationally, is currently considered one of the most powerful lobbying groups in Washington. Detractors claim that AIPAC support causes politicians to support Israel. Supporters claim that supporting Israel makes sense since it is the only stable democracy in the Middle East.